Thank you for your interest in the LISTSERV t-shirt contest. Because we received such a high volume of requests, our entire t-shirt stock is now depleted. Requests received to date will be processed in the order received as long as supplies last. 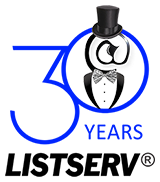 Again, thank you and be sure to connect with us for upcoming activities to celebrate 30 years of LISTSERV®. To enter the contest, wear your new t-shirt and post a photo of yourself to the LISTSERV Facebook page with the hashtag #LISTSERV30. It can be a selfie, a group pic with friends, family, colleagues or pets. Get creative, and remember, only the entrant needs to be wearing the LISTSERV t-shirt in the photo. If you prefer email, send us your photo at: editor@lsoft.com with permission for us to publish it on your behalf. The photo that receives the most likes before the contest closes on May 30th, 2016, will win a $100 Amazon gift card. Feel free to use your own Facebook page to promote your photo and encourage likes. L-Soft will notify and announce the winner in June.